Here are a few of the walks we hope you'll join us on. 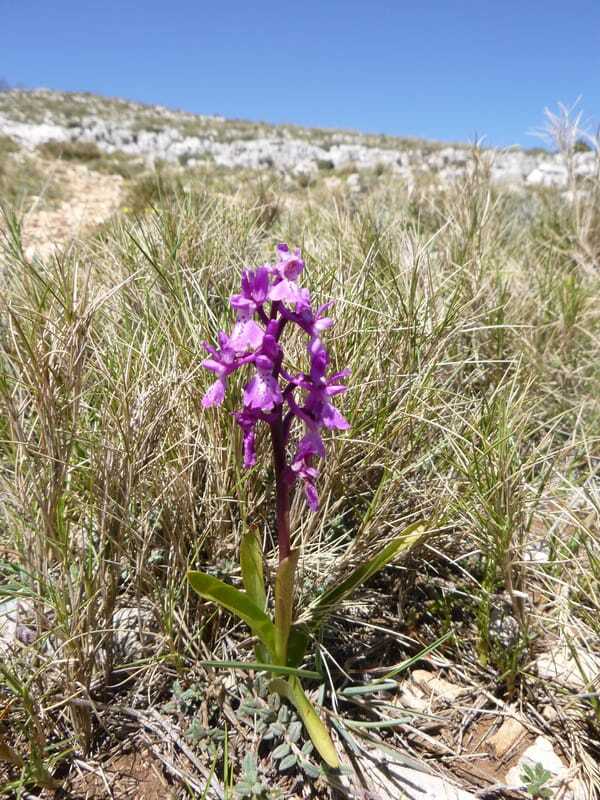 We are spoilt for choice with so many fantastic walks in the Costa Blanca mountains and will continue to add to the list and of course keep walking new routes which we can then share with you! This is a favourite walk of ours which not only reaches a wild and airy summit but also completely circumnavigates the mountain giving one a real feel for its majestic beauty. The walk starts by heading steeply up a pine clad valley which provides welcome shelter from the heat of the sun. It passes under the mountains huge red limestone cliffs and rocky pinnacles - popular with rock climbers. There are several cols where one can stop and admire the views before turning off onto a small mountain path to the summit which crosses rocky steps and scree. The summit of Monte Ponoig (1182m) is at the end of a long ridge and a place to sit and admire the surrounding land with views across to the Puig Campana (it’s neighbouring mountain), the rocky ridge of the Sierra de Bernia and the blue seas beyond. The log book hidden in a box on the summit shows how popular the mountain is but whenever we’ve been there we’ve always had it to ourselves. The descent meanders through cultivated terraces of olive and almond groves before finally passing through more pine forest. Distance – 8.5km. Ascent – 540m. Time – 3 to 4 hours. Castell de la Serrella (or El Castellet) is a Moorish castle which occupied a strategic position until the 17th century and is positioned on the top of a rocky summit and protecting the Guadalest valley. Much of the ascent and descent to El Castellet is on small winding mountain paths with the higher section of the walk is on good wide tracks. For those who enjoy a bit of easy rock scrambling it is possible to access the summit and to see the castle ruins. This is a good walk for those wanting a shorter day out and for getting immersed in a little bit of Spanish history! There are not many walks where you go through a tunnel (forat) from one side of the mountain to the other…this is one of them. 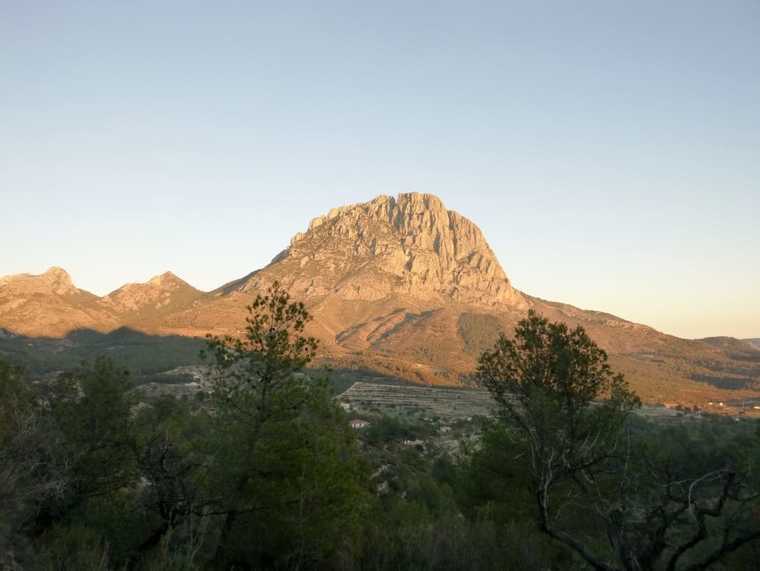 The route ascends up the shady north side of the Sierra de Bernia until it reaches the foot of the huge crags and the ‘forat’ which you leads to a big cave on the south side of the mountain. 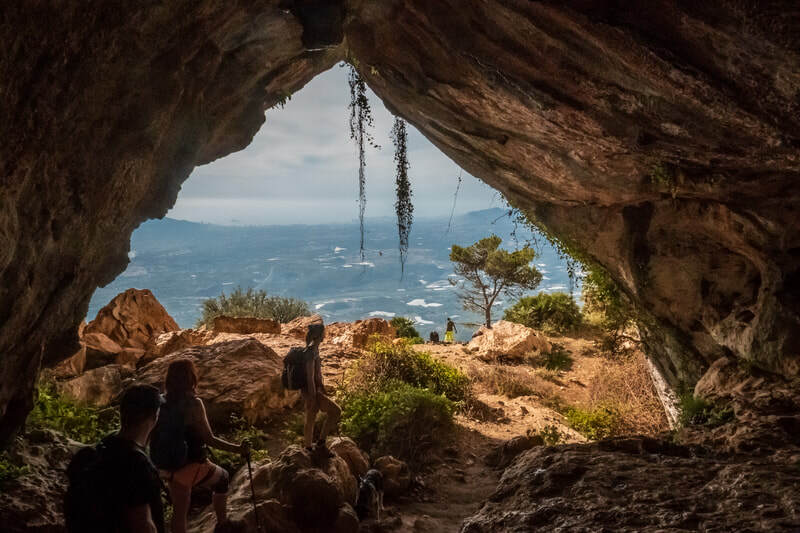 We pass prehistoric wall art and the ruins of the Moorish Bernia fort and on top of this there are spectacular views of the narrow rocky ridge which is always towering above us and of the pyramid shaped Puig Campana and the ‘lions head’ Monte Ponoch to the south. 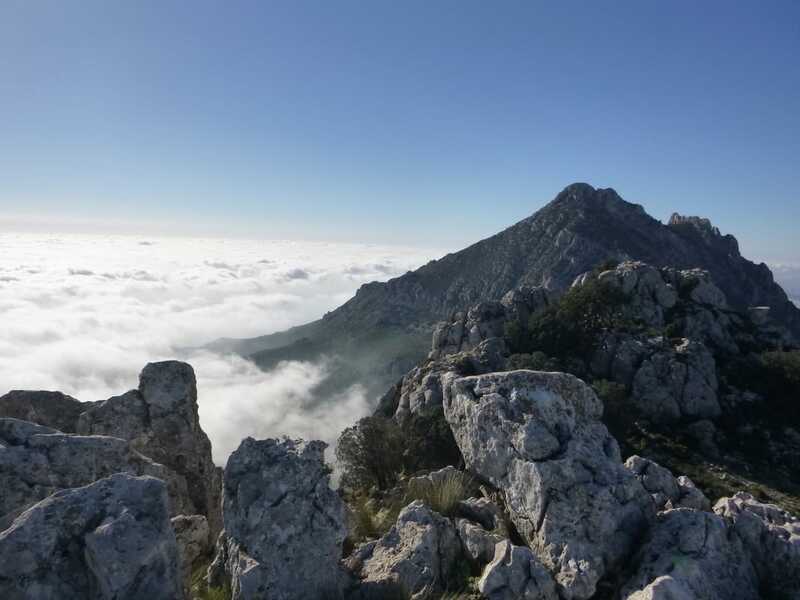 Aitana (1558m) is the highest mountain in Alicante province and although not at all spectacular from afar compared to some of its neighbours, such as the Puig Campana one soon discovers that the mountain is filled with lots of interest and dramatic scenery. The walk starts at the Font de Partagat which is a popular place for picnics and where you’ll see locals filling up bottles, as this pure spring water is often preferable to the tap water in some areas. Our path then heads up to the Port de Tagarina and from there to Penya Alta. Soon after this and on route to the summit one comes across the Simas de Partagas – several huge limestone fissures which were formed by the collapse of subterranean cavities – you can’t see the bottom on some of them! 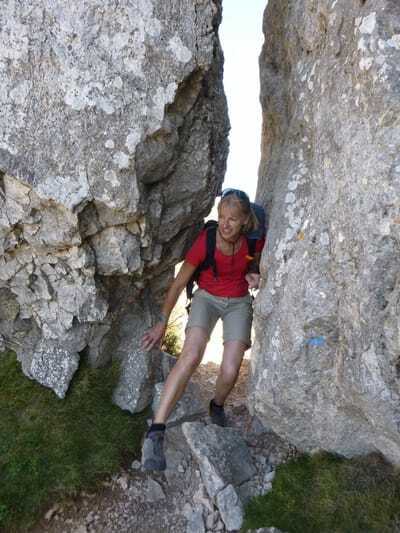 After a visit to the summit we then descend back via the Simas de Partagas find the Pas de la Rabosa a narrow cleft between the rocks which the path squeezes through - well hidden and seemingly an unlikely route until you are upon it! We then traverse across the mountainside until reaching an old snow pit (posa de nieve) – these snow pits date back to the 18th century and were used to supply ice to the coast and surrounding villages and there are many of them in this area. We also pass by the Font de Forata with its lovely stone water troughs and the Font de l’Anouer which is used by a secluded finca for the cultivated terraces. This is a walk with a wild feel, taking you off the beaton track, following small mountain paths and a fantastic ridge. It starts at Famorca, a small village high in the mountains with a handy restaurant near to where we park! 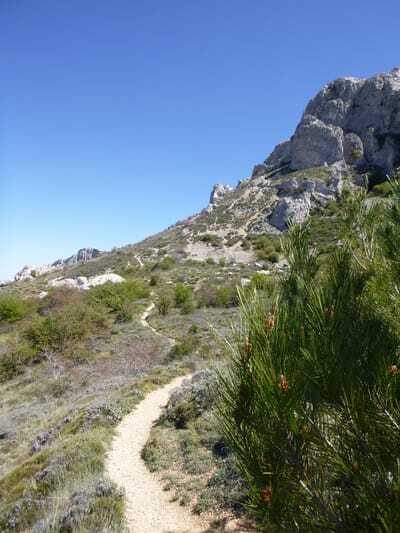 The small path traverses upwards across the mountain, below the crags of the Aspres de Famorca until one eventually reaches a col with views across to El Castellet (Serrella castle). We then head into the Barranc de la Canal and follow it upwards below the huge crags which loom above on either side, passing three well hidden snow pits which were used back in the 18th century to provide ice to towns and villages on the coast. From the top of the barranc it's not far to the summit of Mallada del Llop with views down into the beautiful Guadalest valley. 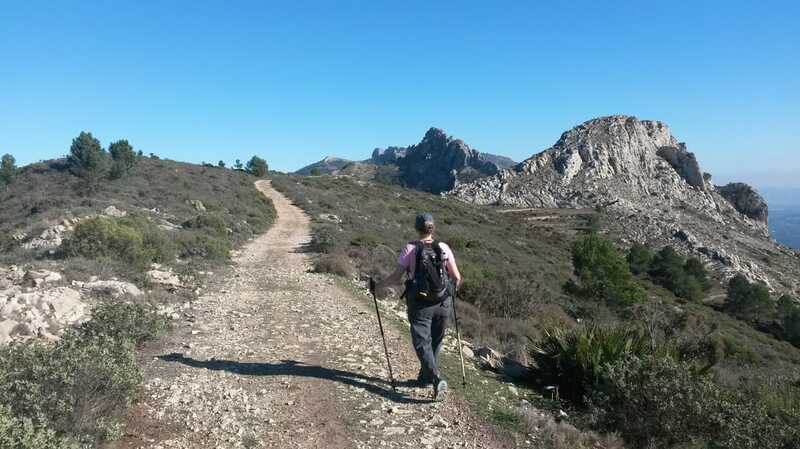 The next section of the walk is my favourite, following the spectacular ridge towards the summit of El Regal, whilst all the time your eyes are drawn over to the Sierra de Serrella beyond. From here it’s downhill past the Clot del Noguer where you may hear and see herds of goats, and on to the Font del Noguer. After passing a walled corral the path winds steeply downhill back to the village and the end of the walk. At 1408m high the Puig Campana is the 2nd highest peak in Costa Blanca. It is also one of the most beautiful with its pyramid shape when viewed from the north, it’s huge southwestern buttress and Tajo de Roldan (a square notch in the ridge seen from the west). 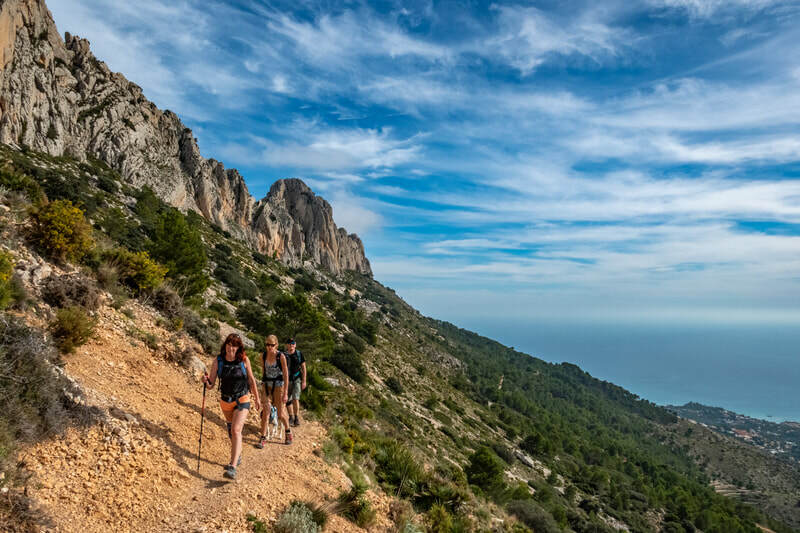 The walk is a strenuous one but worth the effort for its beauty and magnificent all round summit views of mountains and sea, including views of El Penon de Ifach jutting out into the sea at Calpe. There is an option of routes up the mountain. One can head up the long and steep Baranc de les Marietes, a huge scree filled gully, slow and difficult but really worth the effort! When the col is reached the main summit path traverses its way rightwards, a little more gently, until we reach the mountain top with its trig point, log book and amazing views. The descent is then down the northern slopes of the mountainside through the developing nature reserve, first over rocky steps and scree and then on easier paths through woods of Holm Oak and Pine to the Col de Pouet. Finally we traverse on a lovely path through Gorse, Rosemary, Lavendar and Cistus plants beneath the western side of the mountain, beneath the southwestern buttress where it is possible to see the tiny figures of climbers high up on the cliffs. Alternatively to avoid the steep baranc one can ascend and descend the northern side of the moutanin from the Col de Pouet - an excellent choice for hot days. The route passes through the nature reserve (as described above) on a steep mountain path with several rocky steps and scree to cross but a pleasant alternative to the Baranc de les Marietes.